One epic night of the best of the 70’s with Don Felder’s Eagles hits like Hotel California, Those Shoes and many more! More incredible music from the Iconic band Little River Bands performing the huge hits of “Lonesome Loser”, “Got You On My Mind”, and “Lady” and the epic hits don’t stop there. 70 & 80’s band Ambrosia brings their hits like “How Much I Feel and Biggest Part of Me”. And the night doesn’t stop there with more classic 70’s music from Firefall with hits like “You Are The Woman”, “Strange Way”, “Just Remember I Love You”, and many more! 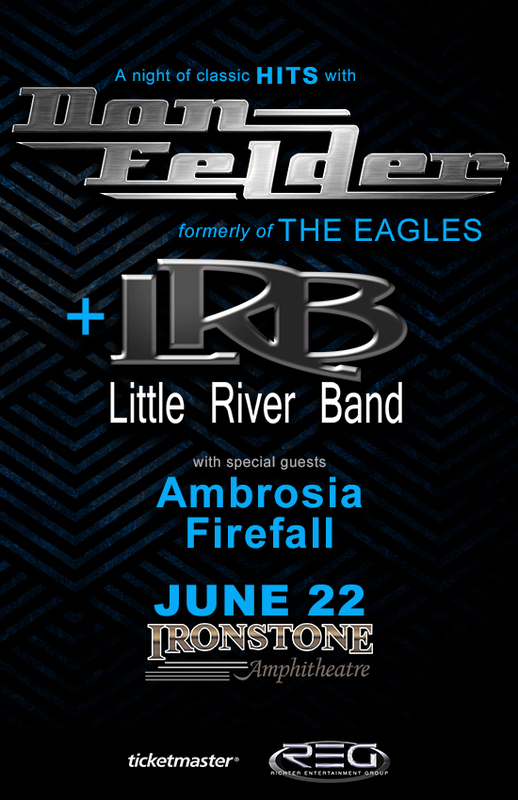 For the Don Felder, etc show 6/22, is a buffet included when you purchase a ticket in the Buffet section (i.e.,$278+fees for front row)? Yes it should be, you should have a detailed receipt that shows both a concert ticket and buffet ticket when you check out. Just to be clear, in the final purchase window, there is a box asking if you wish to purchase a buffet for $65. I actually bought a ticket in the front row without paying the additional $65. The ticket did not say clearly that a buffet was included, only that it was in the BUFFET section . When I called Ticketmaster, they weren’t 100% sure so I requested a refund. If you tell me that a buffet is included in the $278 (+fees) ticket price, I will reconsider, but I don’t wish to pay the additional $65. Yes if you clicked on the Buffet Section then clicked to the right and picked the Buffet ticket Row 1 that DOES INCLUDE the Buffet. You are all set. Thank you! We’re members attending the concert. How do I RSVP for the members pre-party event? Please contact the Winery and ask for their Wine Club representative and they should be able to assist you.